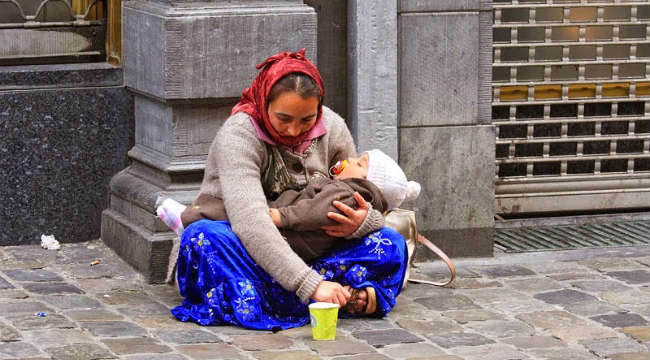 Most of us live in urban areas, in busy cities where nature is tamed and does not take an important place in daily life. 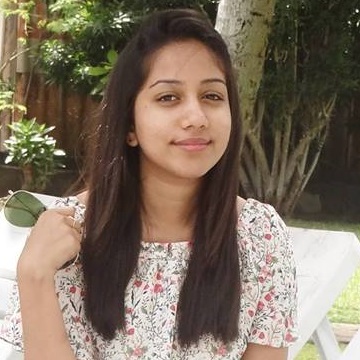 Therefore, we always talk about the things which are very common to us, as an example, it could be either dreamy landscapes or some cute puppies. Many of us are not aware that our Nature holds a dark side. We can also call it as Mother Earth’s scariest ‘children. Auxx me has found some scary and unbelievable images of nature’s dark side. Walking in nature is free and efficient therapy for our stressed, fast-paced lives, at the same time, it could also scare us to death. You can now scroll down and see nature’s dark events. No that isn’t the camera angle, that is actually one big bat. 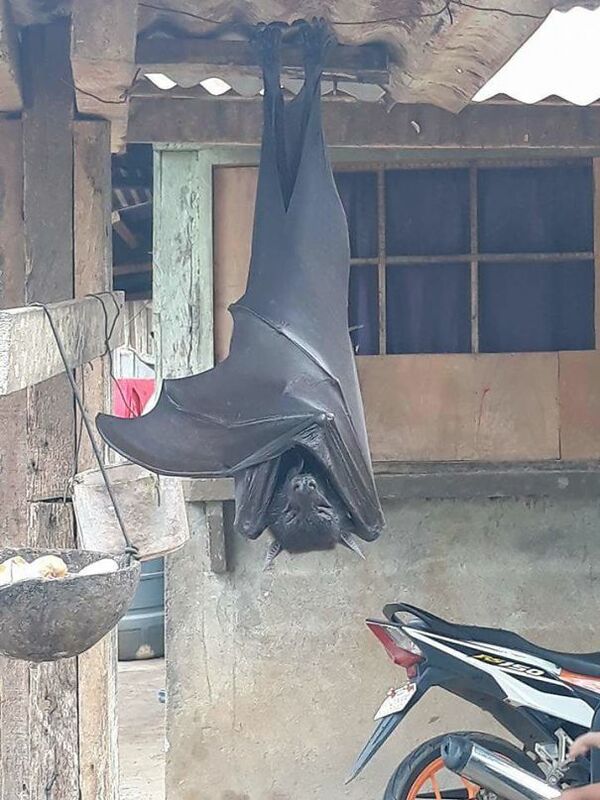 The flying fox also called the fox bat are among the largest bats in the world with a wingspan of 5 feet (1.5 meters) and a head and body length of about 16 inches (40 centimeters). They are found on tropical islands and the mainland of Asia. 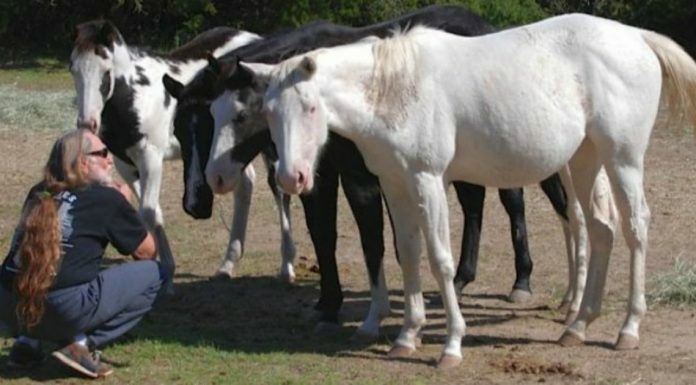 As scary as they look, these gentle giants only eat fruit. 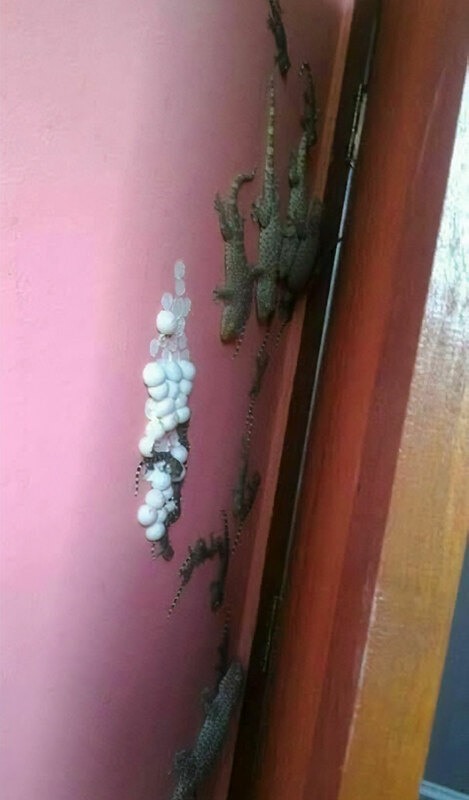 Did you know that some lizards lay eggs while some give live birth? That’s right, while you will find lizard eggs of geckos, iguanas and monitor lizards, you won’t see blue tongue lizards, Solomon island lizards and shingle-back lizards laying eggs! They give birth to their live offspring. 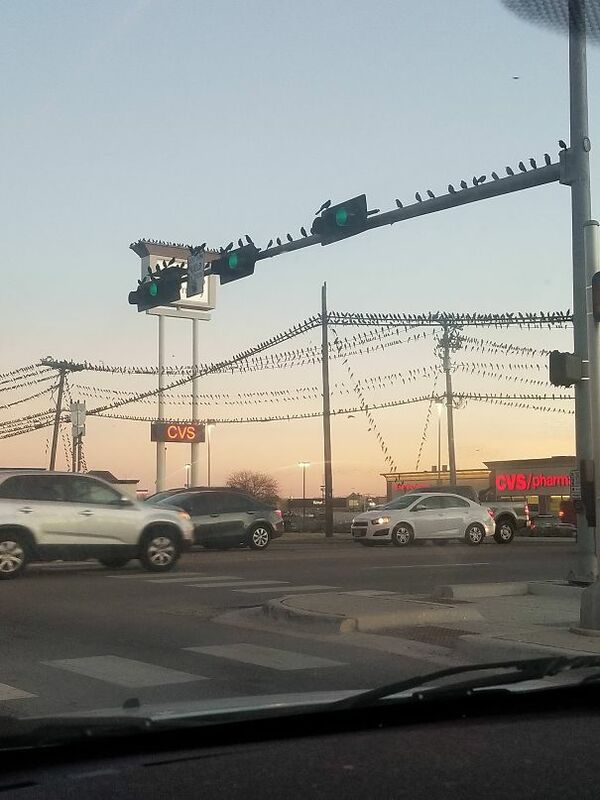 This may look like a shot from Alfred Hitchcock’s The Birds, but this eerie scene was created by none other than mother nature herself. 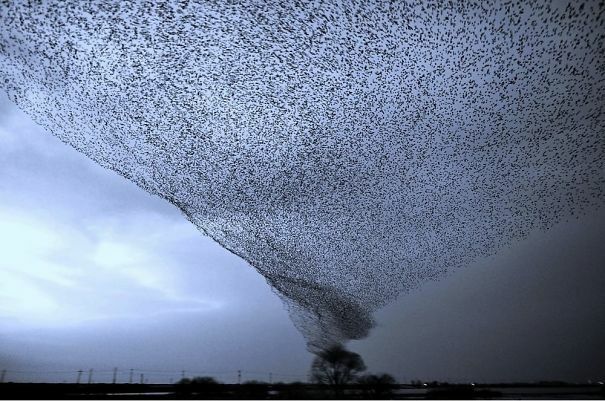 A Reddit user posted the shot to the site’s r/WTF thread and titled it “birdnado.” The cluster is thought to be made up of starlings, a bird is known for flying in thick flock formations called murmurations. These clusters reduce the amount of energy required during travel and protect them from predators. If starlings sense a shift in one part of the flock the entire pattern will shift. 68mm just fell in the last hour at Kununurra. Flushed all the cane toads out of my brothers’ dam. 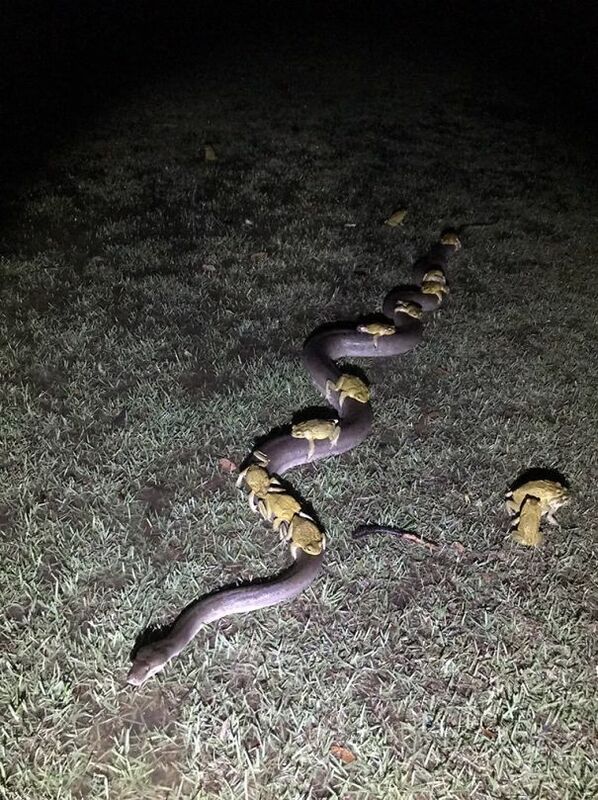 Some of them took the easy way out – hitching a ride on the back of a 3.5m python. Pike fish are freshwater fish known as ambush predators because of their ability to lie perfectly still for an impressive amount of time, thankfully for these birds, this pike is out of the water so it’s safe to say it’s actually dead. 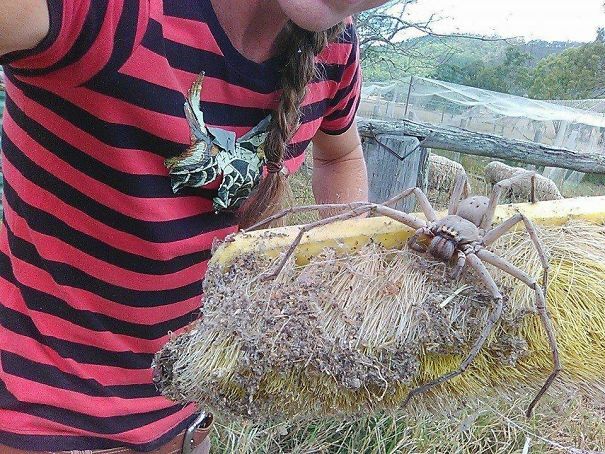 This is the huntsman spider, a common friend to be found in houses and garden across Australia. He’s harmless really, don’t let his large size intimidate you. Huntsmen won’t bite humans unless provoked, are not venomous and are actually handy to have around the place, he’ll use his speed and agility to keep your cockroach population under control. Think of the Huntsman as a handy pet. Respect his space, let him do his job and he’ll look after you well. Did you know that bees swarm when the queen bee leaves the colony with a large group of worker bees? It’s how a new honey bee colony is formed. In the prime swarm, about 60% of the worker bees leave the original hive location with the old queen. 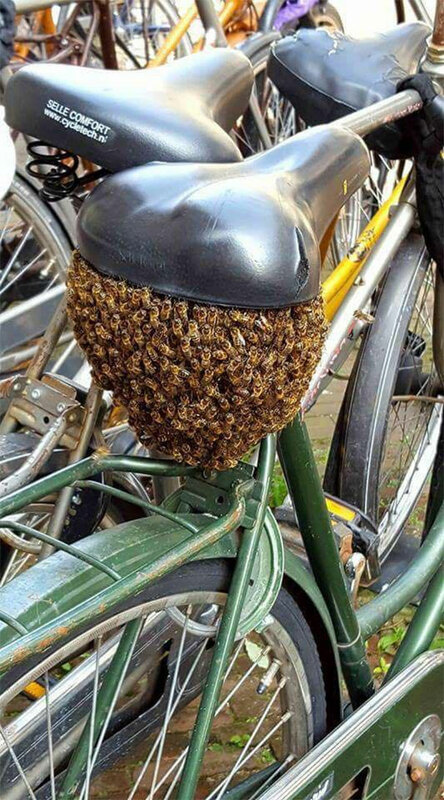 This swarm can contain thousands to tens of thousands of bees. Usually, swarming takes place in spring, within a two- or three-week period, but occasional swarms can happen throughout the producing season as well. Geckos are reptiles found in all parts of the world except for Antartica. 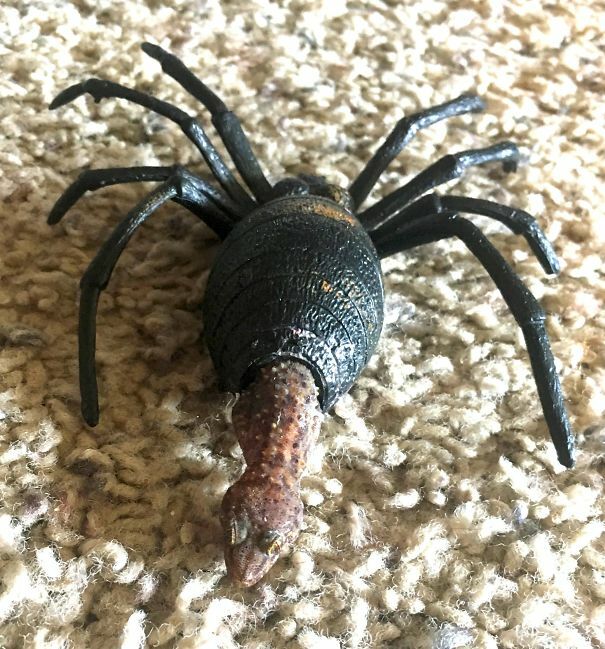 To avoid predators they have developed special features such as camouflage to help them hide in any environment (even a toy spider). Most geckos are nocturnal creatures which means they are active at night, but there are day geckos which are willing to venture out during the daylight hours in search of food. 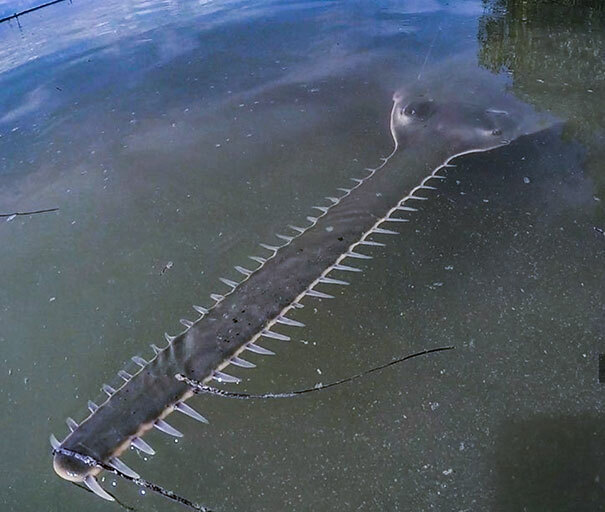 Sawfishes are large rays that are characterized by their long blade-like snouts. Along with this elongated snout are lateral tooth-like denticles set inside sockets – which give the allusion of a giant chainsaw. Sawfishes use their “saw” (rostrum) during feeding time and to defend themselves. The rostrum will slash in a side-to-side motion and dislodge invertebrates from the substrate to stun fish. 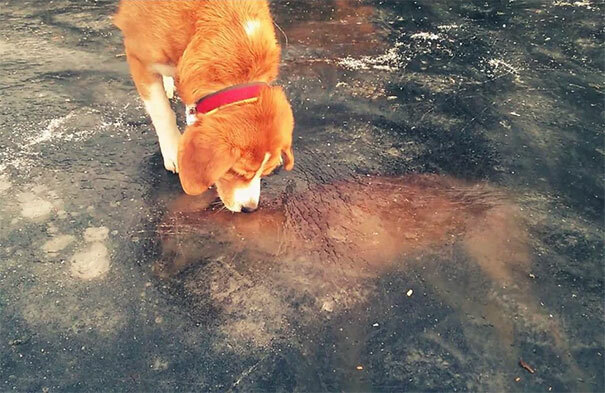 This poor fox obviously fell into the freezing water, perhaps pursuing prey onto thin ice, and drowned. 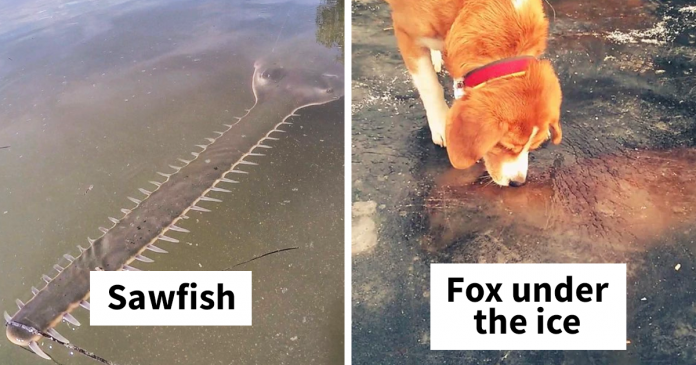 We’d like to think that its doggy cousin is paying condolences in a sweet moment of canine comradeship. 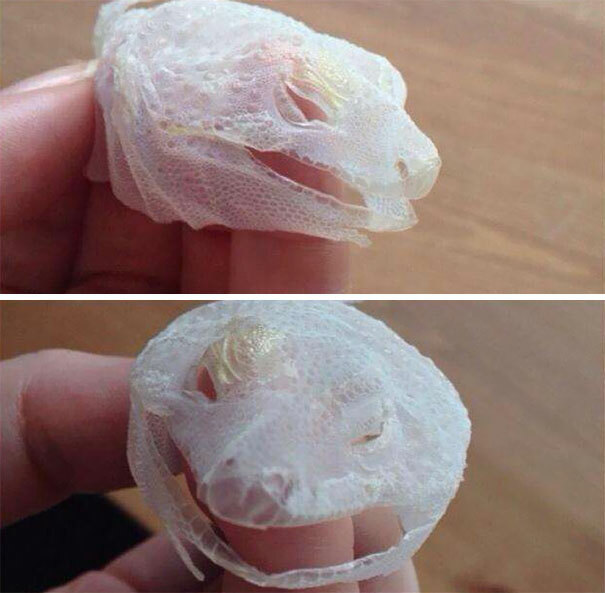 If you want to peel off the skin from your pet lizard’s head, you should try to take it off in one piece, and you want to make sure that it’s ‘released’ around the ears. Also, be extra careful around the eyes. #13 Mother And Girlfriend Found This On The Beach Today. Any Idea What It Is? 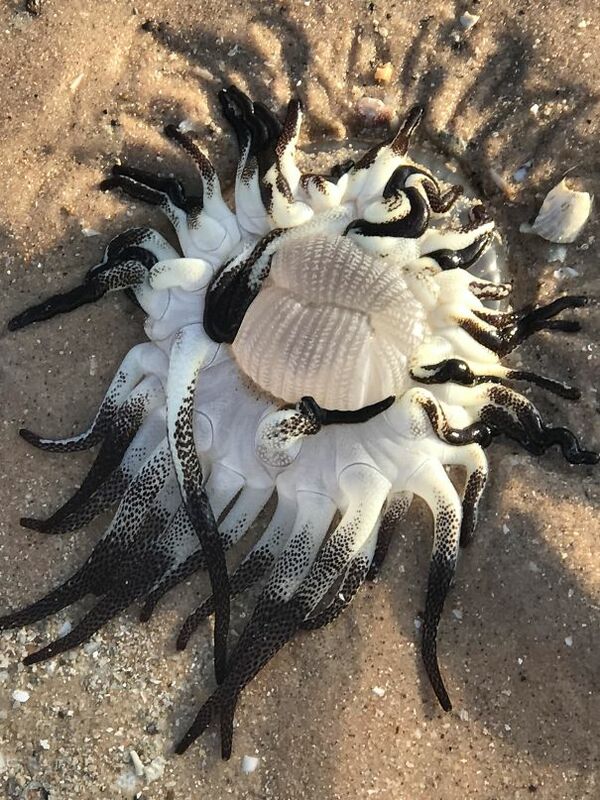 his was found in Broome, Western Australia and looks like an anemone. More specifically, Dofleinia armata, the armed anemone. Also called the striped anemone. It is considered extremely dangerous as it can inflict painful stings that take months to heal. 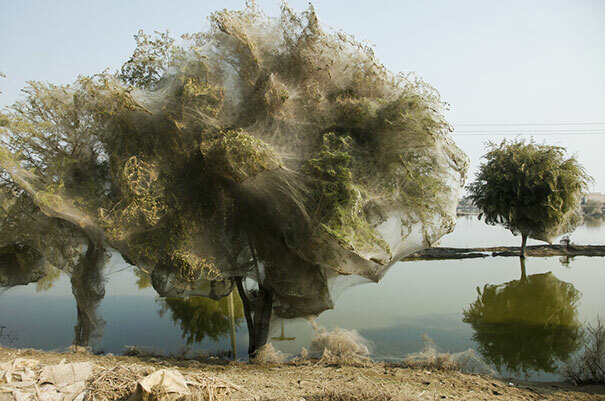 In 2010 a monsoon hit Pakistan that caused the rivers to swell and insects to run for cover. The strange anomaly was captured by aid worker Russell Watkins, a multimedia editor with the U.K.’s Department for International Development (DFID) in the Pakistani village of Sindh.”There wasn’t a scientific analysis of this being done. Anecdotally, I think it was pretty much any kind arachnid species, possibly combined with other insects,” he told National Geographic. It was noted that because the flood waters took so long to recede, spiders who had sought asylum in the trees had just begun to spin weaves. Locals said they had never seen anything like it before. This nightmarish creature is the snaggle-toothed snake eel or the Aplatophis zorro. It is a tropical eel found in the eastern central Pacific Ocean. 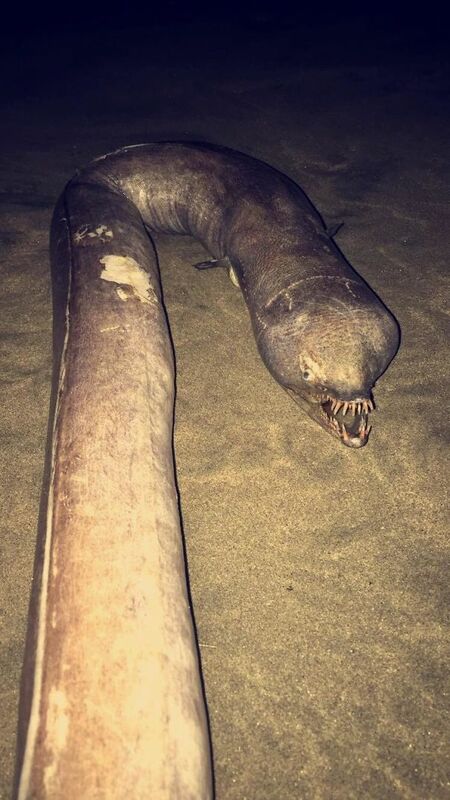 According to the specimen found and studied by John E. McCosker and David Ross Robertson in 2001 they can reach a maximum length of 104 centimeters or 3″4 in feet (gulp). The eels live at 5-10 meters deep and live in burrows. We are well aware of the weird and wonderful creatures that inhabit the vast depths of the ocean, but this bigfin squid is very rarely seen, and little is known about them as a species. This is the best and most recent footage of the elusive creature, taken on 11 November 2007 by an oil company in the Gulf of Mexico. The species are very distinct from all previously known squids, with the length of the elastic tentacles estimated to be up to 15–20 times the body length. Estimates based on video evidence put the total length of the largest specimens at 8 meters (26 ft) or more. A macromutation is a mutation that has made a significant impact on an organism, caused by a change in a regulatory gene that’s responsible for the expression of an array of structural genes. 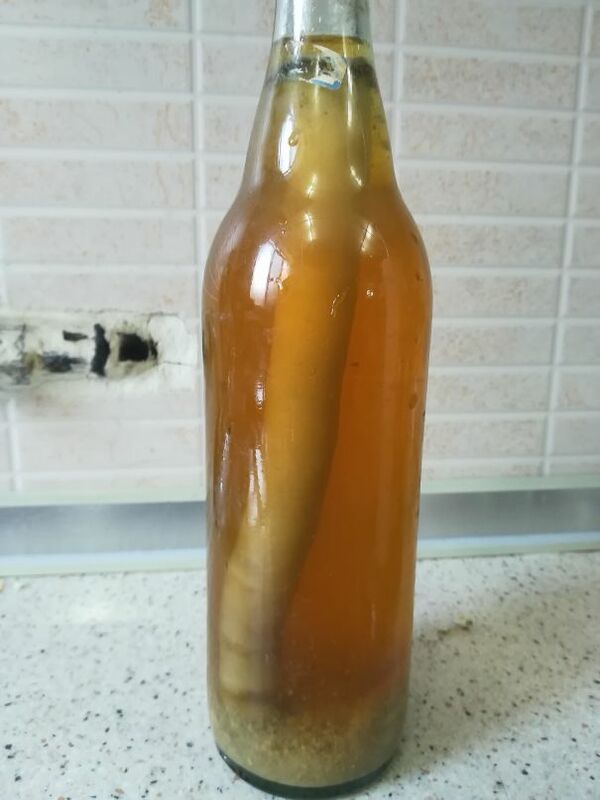 It’s been suggested that the cause of the mutation was the result of parasitic infection by a trematode worm (Ribeiroia ondatrae). 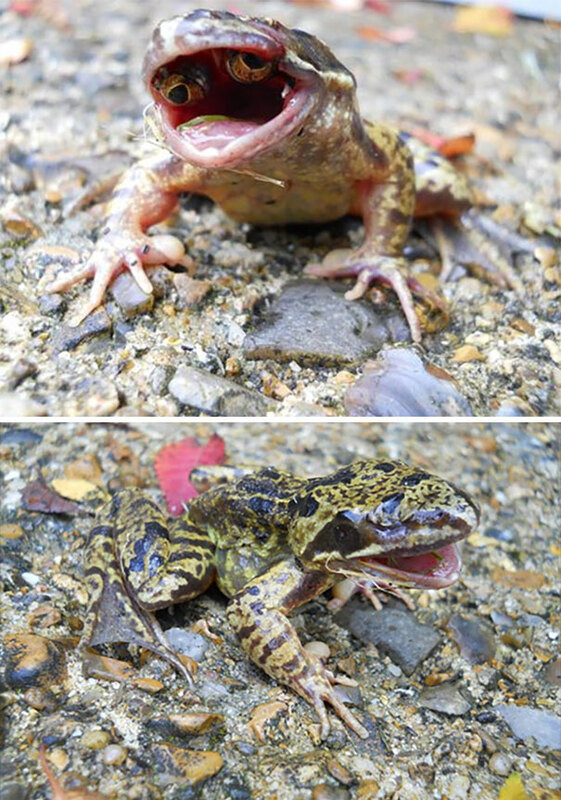 Trematode infections have reportedly been linked to an increasing number of amphibian limb mutations, particularly missing, malformed, and extra hind legs. 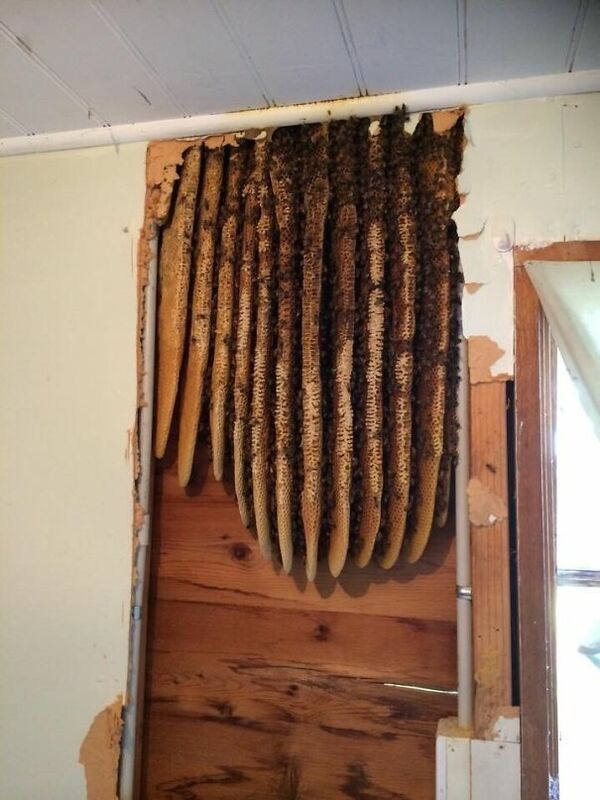 Bees can find a cozy space between walls, causing issues for homeowners. How do you tell them to leave? 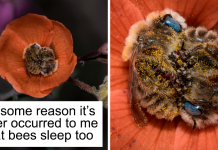 We all know the value that bees have for ecosystems so simply gassing them should not really bee and option. They can cause damage and mold though, especially if they are honey bees, so should be removed. Call a professional beekeeper to come and take the hive away, don’t attempt it yourself! As you can see, our spiky little friend wears his spines, which are made of keratin like our hair and nails, like a fur coat. 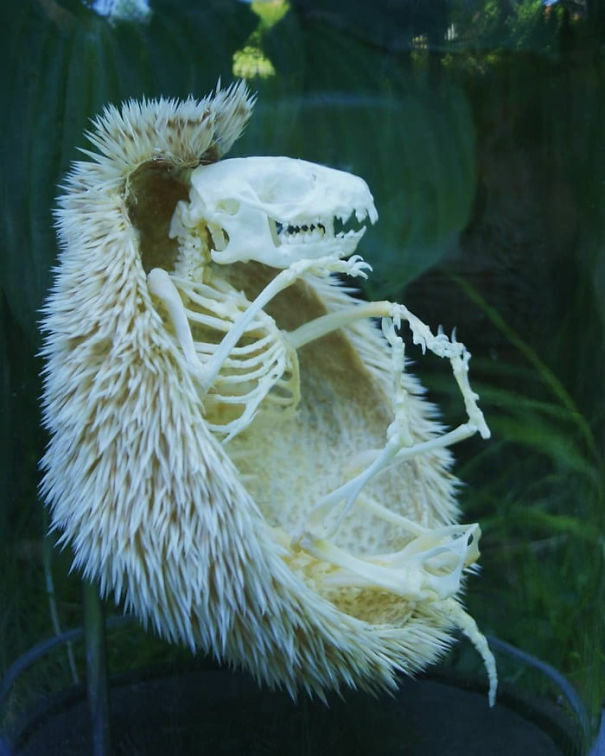 The spines, unlike porcupine spines, don’t easily attach from their bodies and are neither poisonous nor barbed. They can still be painful to the touch though! 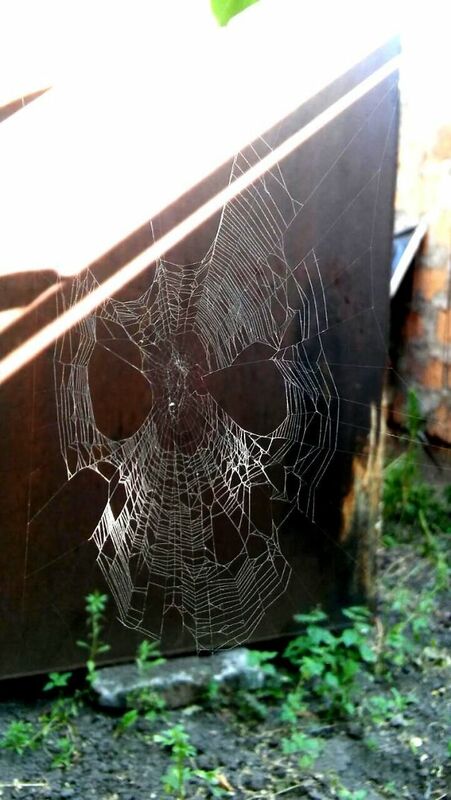 Light, temperature, and humidity can affect the strength of a web. The adhesive droplets that spiders apply to their silk become sticky only when the silk leaves the spider’s body. 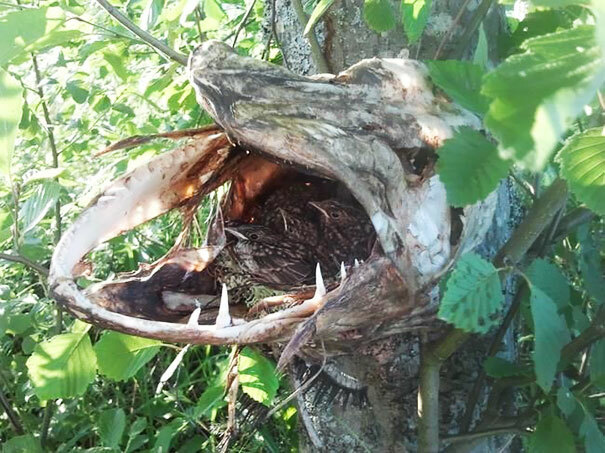 But its strength can be affected by environmental factors, thus transforming into a creepy skull like this one. Lactarius Rubidius, more commonly known as the ‘candy cap’ mushroom, is found in western North America and is known mainly as an aromatic mushroom. Instead of being eaten as a vegetable, they are instead used mainly as a flavoring in a way similar to vanilla, saffron, or truffles. 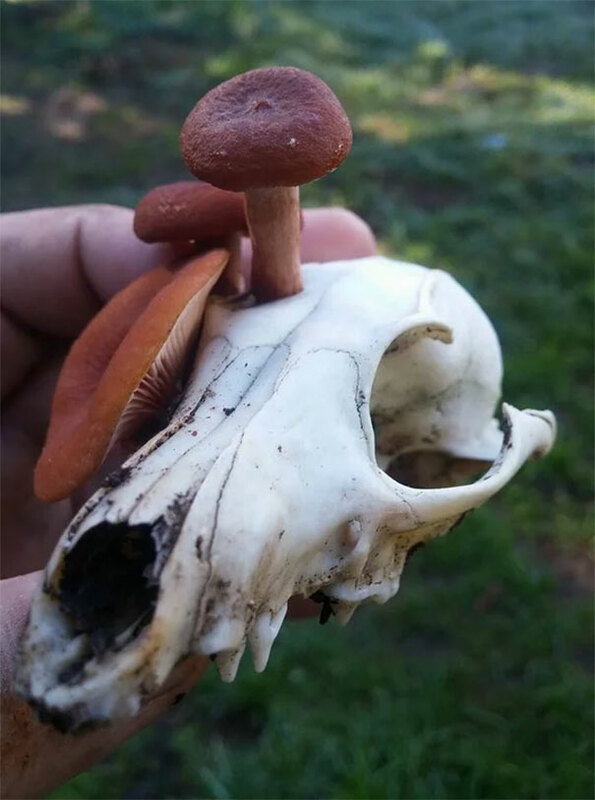 Would you eat this one if you found it? 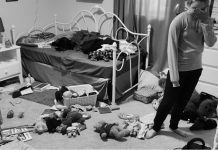 Things like this can happen when people fumigate. Insects try to escape chemicals by crawling into tight little places. Then they usually die. This looks like it could be a cylindrical yeast colony. They form when nutrients settle on the bottom below the colony, allowing it to form vertically. This cozy fella has been identified as a ratsnake. Native to North America, ratsnakes are commonly found in the forests of the eastern and central United States and are essentially harmless to humans. 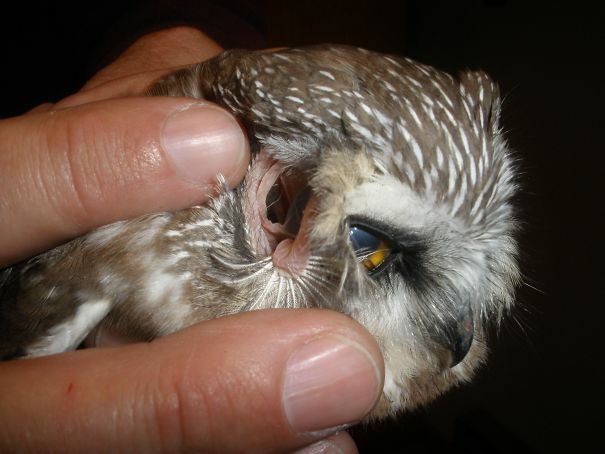 If bitten by one of these critters, the most you will need is a small bandage, they are not venomous. 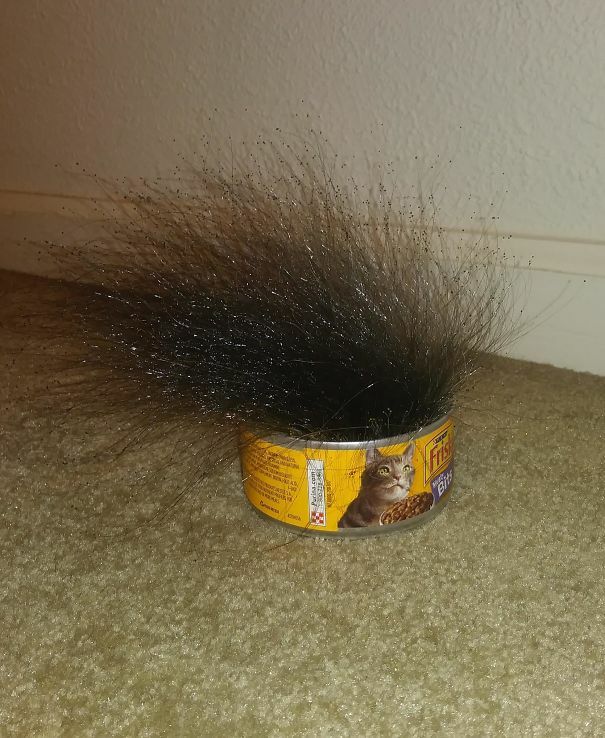 As the name suggests, their diet consists largely of small rodents, meaning they can often be found around barns and garages. 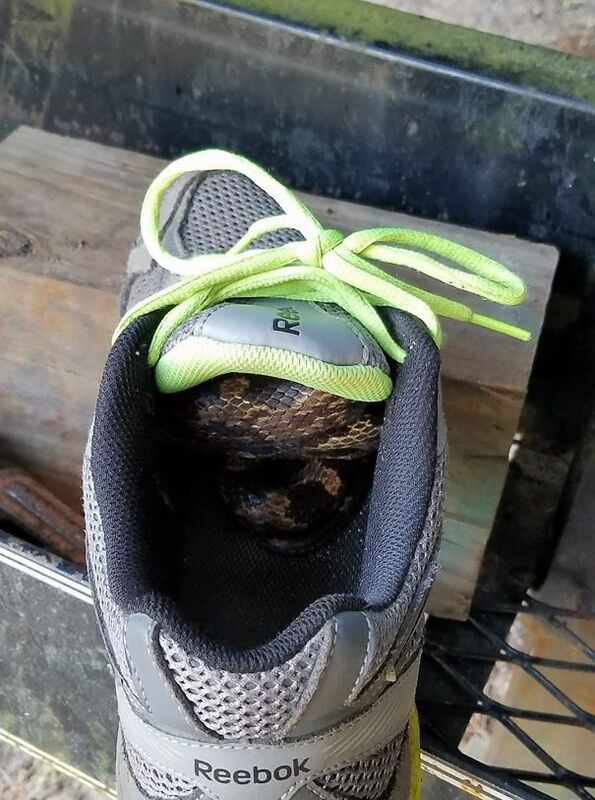 Careful handling them though if you do find one in your shoe, instead of biting they are more likely to cover their victim with a foul-smelling musk! 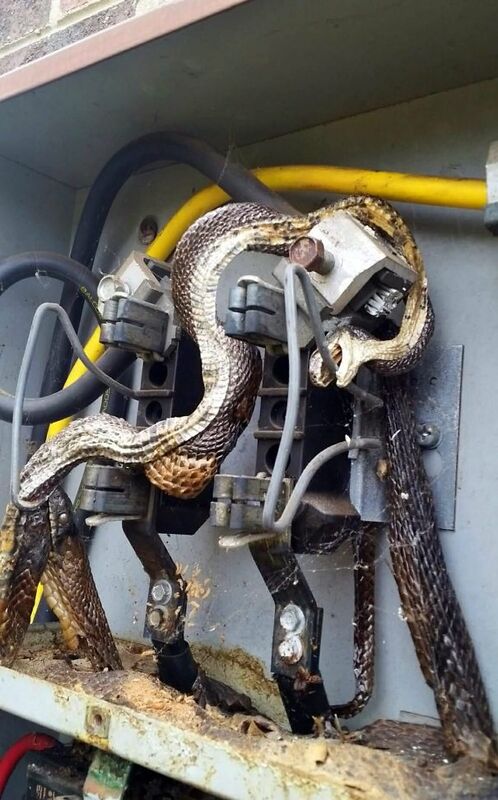 This shocking situation occurred within a power box and is just a terrifying ma-ssss-acre of serpentine proportions. Perhaps it was a botched rescue attempt after one poor snek found himself in trouble, his buddy tried pulling him away and suffered the same fate. Either way, it’s truly the stuff of nightmares. The plant grows underground, except for a fleshy flower that emerges above ground and emits an odor of feces to attract its natural pollinators, dung beetles and carrion beetles. The flowers act as temporary traps, retaining the beetles that enter long enough for them to pick up pollen. 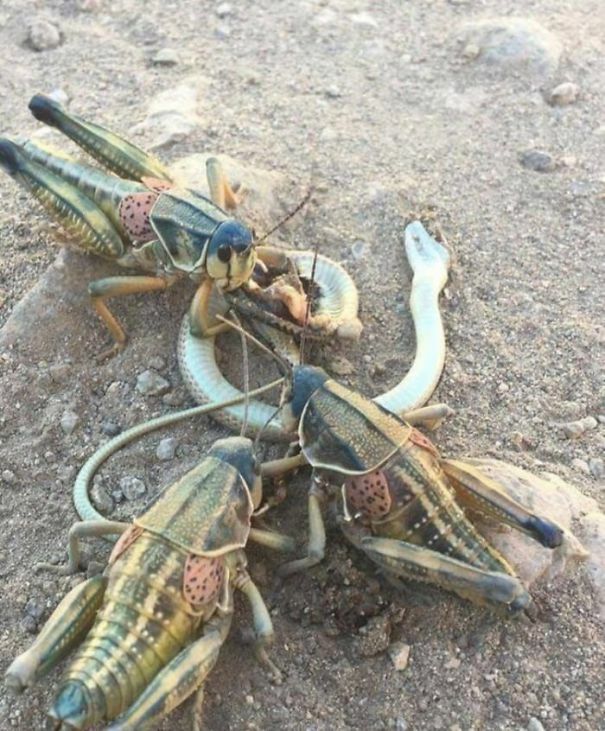 It’s hard to say how large these terrifying-looking locusts actually are. Are they true giants, or is the snake just a lil nipper? Either way, they appear set for a lovely sit down meal. 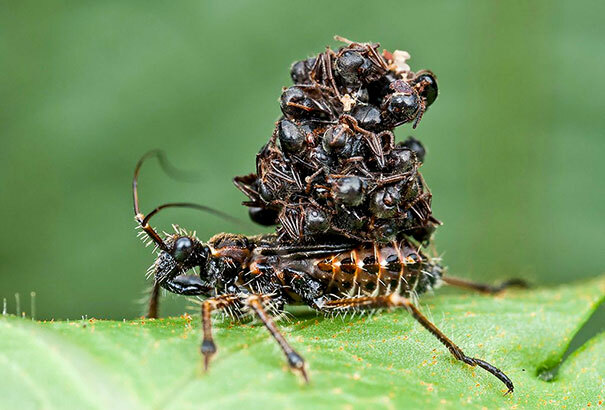 This terrifying and aptly named insects inject a lethal saliva into their prey which liquefies the insides, which are then sucked out. The corpses of the emptied out creatures are then worn as camouflage by the cunning assassin. The camouflage is to protect the bug from being preyed on by jumping spiders, but if anything you’d think it would make them look even more tempting! By the looks of it, this could be a type of fungi called phycomyces. Phycomyces is not known to produce toxins, although its chemical composition has been investigated in considerable detail. 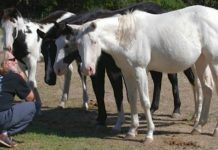 It is probably safe for mammals: the fact that the dung of small mammals is the best natural source for Phycomyces spores suggests a regular consumption as food.